Despite posting decent financial results this year, top line sales have been quite a challenge for our grocers so far. Coupled with a somewhat weak food inflation rate, sales at major food retailers are tumbling faster than Niagara Falls. Recent StatsCan figures suggest the market shift many industry pundits were dreading is indeed happening. Top grocers such as Loblaw, Sobeys and Metro are seeing their world being turned upside down by consumers who are more than ever obsessed with convenience. In other words, grocery shopping habits are changing, and fast. The most disturbing of the recent statistics are the retail sales generated by the food sector. Supermarket and grocery store sales decreased 3.1%, in a single month. Food retail sales dropped by $221 million in May. Such an amount could be enough to force grocers to close almost 30 decent-sized stores and put nearly 2,000 people out of work. That’s only for the month of May. StatsCan reports that retail food sales have been down in four of the last five months. Convenience and speciality stores are bucking the trend and are faring much better. 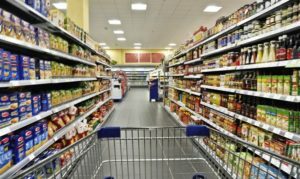 Food sales from convenience stores have increased by more than 6% since last year while speciality store sales have increased by more than 10%. In other words, the major chains are seeing their customers flee as food demand is becoming more fragmented. Most Canadians would not have thought of convenience as, well, fitting to their modern lifestyle. But an increasing number of Canadians are apparently getting a taste of it and want more. Ready-to-eat solutions are more prominent than ever. Even vending machines are increasingly becoming go-to places for quality meals consumed outside the home. Online food shopping, mostly for non-perishable staples, is also becoming common practice for consumers, thanks to what is now known as the Amazon effect. With the ready-to-cook segment growing at an incredible rate, now worth almost $200 million in Canada, fewer shoppers are showing up at the grocery store. Or at least, consumers appear to be spending less at big box stores, forcing grocers to go after consumers’ money, instead of just waiting for it to come to them. Food inflation is another source of pressure. The national rate sits now at 1.4% for the month of June, compared to 1% in May. Prices are back on the upswing, yet in many parts of the grocery store, prices are relatively stagnant. Given that the cost of food eaten outside the home is still showing dramatic increases, up by more than 4%, food inflation data remains cruelly misleading for grocers. Food service is progressively winning over food retailing. According to Statistic Canada, at retail, almost everything is now cheaper than it was in January. Of the more than 45 items in our typical food basket, half cost less than they did at the beginning of the year. Round steak, pork chops, bacon, chicken, pasta, and even eggs are all less expensive. Roasted coffee is a surprising 17% cheaper than it was in January. But consumers are not spared inflation entirely. Apples are up 11% since January, and carrots are up 22%. Ottawa’s reactionary measures against the Trump administration may have also enticed grocers to increase prices ahead of the July 1st deadline, when 10% tariffs were imposed on specific U.S. imported food products. Tariff-stricken categories like ketchup and orange juice have seen prices go up in June by 4% to 5%. Orange prices were especially affected, increasing by 13% in one single month. The overall inflation rate is 2.5% which boosts chances for a Bank of Canada move. Interest rates could be increased within the next several weeks, putting even more pressure on grocers who are looking at investing as a means to compete in the era of the omnichannel business model. For consumers, borrowing money will cost more and a growing number of them could start to trade down when food shopping. Grocers are not only trying to keep foot traffic at a decent rate in their stores, they are also extending their e-commerce strategy. They just don’t have much of a choice. Costco has just announced it will run a pilot project in Ontario to evaluate market potential for home delivery. With less than 100 locations in Canada, compared to the thousands of outlets owned and operated by major grocers, Costco will make things interesting over the next few months. Costco’s discounting has impressed many Canadians as its market share is already at 12% in Canada, up from 9% just a few years ago. Given how much one buys at Costco, buying online and have someone carrying everything for you is a suitable proposition, isn’t? Grocers will need to continue to innovate and accept the fact that “business as usual” in food distribution is strategically suicidal. Canadians are deserting the old model and seeking something new, at a much faster rate than expected. Losing 3% of sales in one single month is just not sustainable. This is what disruption looks like in food distribution. SYLVAIN CHARLEBOIS, Professor in Food Distribution and Policy, Dean of the Faculty of Management, Dalhousie University.